The morning newswire of Exame (Editora Abril, Brazil) suffers from a defect common to a lot of online news portals here: Flash-powered roll-down ads that fail to roll back up, obscuring your view of the headlines if you happen to prefer the Firefox browser. The proportion of non-events — “[São Paulo governor] Serra has not decided yet what to do about CESP” — mere press release rewrites, and reheated wire copy without much of a local angle is fairly high. The clipping service of the Ministry of Planning is often a good place to start, followed by a scan of the major dailies before heading to the official diaries and the material events newswire of the CVM and — if you can find it on the exchange’s Web site — the Bovespa’s Plantão Empresas. Of the press release wires, Portal Fator and Maxpressnet are maybe the most interesting. The Informativo Bovepa section in the print edition of Valor repays close attention, but you need high-powered reading glasses to make it out. Valor leads today with an impending speech by central bank president Meirelles (late of Bank Boston) today. The official announcement of the Brasil Telecom-Oi merger is widely reported (all from the same wire story by the Agência Estado, mind you) to be coming any day now. Tupi consumer confidence is at all-time high, reports the National Council of Industries (CNI). Statistics have only been collected since (we partied like it was) 1999. It predicts a major merger in the ceramics industry, and describes signs that the states of Paraná and the Zona Franca de Manaus are engaged in open warfare over which will host the factory of a major domestic home electronics manufacturer. It reports that the Brazilian armed forces are thinking of replacing the Land Rover Defender with a locally produced model that costs 40% less. Among other interesting (but usually unsourced) tips and market rumors. 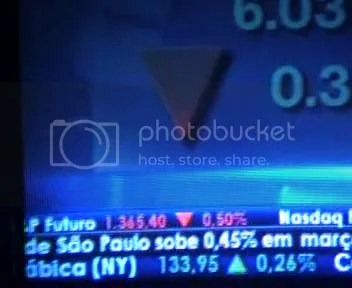 “Cost of living in São Paulo rises 0.45% in March”: New World Lusophone Bloomberg this morning. A partir de 2 de junho, as operadoras de canais de TV por assinatura não poderão mais cobrar pelo ponto adicional para a recepção do sinal. A nova determinação prevista pela Agência Nacional de Telecomunicações (Anatel), através da resolução número 488 de 3 de dezembro de 2007, aprova o Regulamento de Proteção e Defesa dos Direitos dos Assinantes dos Serviços de Televisão por Assinatura. Starting on June 2, subscription TV operators will no longer be able to charge for an additional connection point for the reception of subscription television signals. The finding of the Brazilian National Telecommunications Agency (Anatel) in Resolution 488 (December 3, 2007) approves the Regulation on the Protection and Defense on the Rights of Subscription Television Subscribers. I mention it because we just added a ponto to our cable TV service (Net) here in São Paulo so that I can watch Bloomberg TV and the local equivalent of C-SPAN in my workspace — a habit that drives my soap-devouring, chick flick-hypnotized better half crazy. Portuguese-language programming starts at 7:00 a.m., with gringo Bloomberg running over a Lusophone screen crawl overnight, and the local version offering a mix of translated global top stories and local headlines. Tropical Ralph Naderism here in Brazil is a fascinating story, and tends to underlie quite a few of the more soap-operatic political conflicts and skeevy lobbying gambits you see here, I think. Hobbesian rent-seeking behavior, advocated as a God-given right of the master race, can sometimes seem like the unofficial national sport, alongside futebol. Bauru is an inland city of 350,000 souls in western São Paulo. It is not quite the same sort of place as what my wife likes to call “the technocaipira zone” — the high-tech corridor of the Vale do Paraiba, where people tend to live in smaller cities and be both hicks and tech geeks — but the dynamic is sort of similar. Think Buffalo, or Modesto. There is intelligent, non-metrosexual, life there. A medida prevê que, a partir do ponto extra e do ponto de extensão (conhecido como ponto escravo), somente poderão ser cobrados a instalação e a ativação (uma vez) e a manutenção, que pode ser mensal. A manutenção e a instalação poderão ser solicitadas a terceiros, porém, a operadora não se responsabilizará por eventuais problemas. 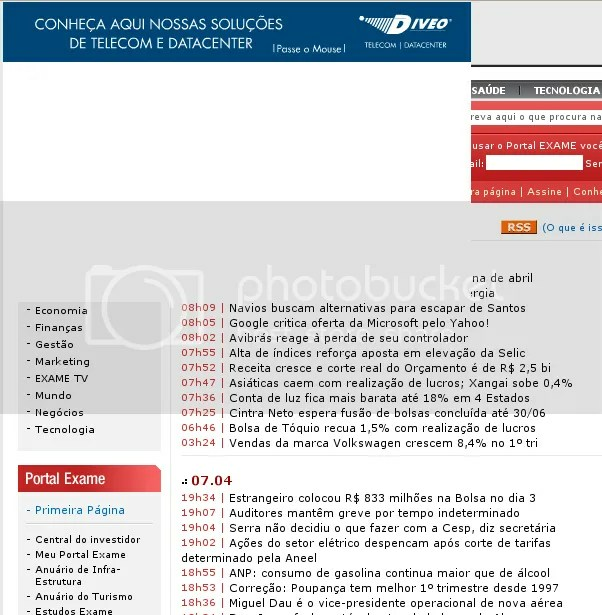 A ativação, no entanto, é de responsabilidade da empresa que oferece o serviço, uma vez que o sinal é codificado. The measure provides that only installation, activation fees can be charged for extra points and extensions (known as “slave” connections), along with a monthly maintenance fee. Maintenance and installation can be ordered from third parties, but the operator is not liable for any problems with such service. It is liable, however, for activation, since the signal is encoded. Among other things, increased disclosure is a boon to publishers, such as São Paulo’s Official Diary (above, occupancy and booking figures for two convention facilities, from SPTur’s 2007 Management Report) — and manufacturers of reading eyeglasses needed to squint at all that fine, fine print. Juntas poderão decidir sobre balanços de limitadas: Valor reports on the prospect of mandatory financial disclosure by the rough Brazilian equivalent of limited liability companies. A discussão sobre a necessidade de publicação de balanços pelas sociedades limitadas de grande porte pode ser definida nas juntas comerciais. A polêmica, que começou no fim do ano passado com a mudança das regras contábeis para as sociedades anônimas e para as limitadas com alto faturamento, levou a Junta Comercial do Estado de São Paulo (Jucesp) a ouvir juristas para decidir se exigirá ou não a apresentação das publicações para o registro dos atos dessas sociedades. The debate over required disclosure of a balance sheet by large [private limited liability corporations] may be resolved by state corporation registrars. The controversy, which broke out in late 2007 with a change in accounting rules for public companies and private companies with substantial revenues, led the state Junta Comercial of São Paulo (Jucesp) to consult legal experts on whether it should require the publication of such information as part of its registration of corporate actions by these companies. A partir da publicação da nova norma – a Lei nº 11.638, de 2007 -, sociedades limitadas com ativos superiores a R$ 240 milhões ou faturamento anual maior que R$ 300 milhões, também chamadas de sociedades de grande porte, ficaram obrigadas aos mesmos procedimentos contábeis das sociedades anônimas. Mas as regras quanto à publicação das demonstrações financeiras dividem opiniões, já que a obrigatoriedade não foi expressa na legislação. Since the new rule went into effect — Law 11,638 of 2007 — private companies (limitadas) with assets superior to R$240 million or annual revenues greater than R$300 million, known as “large-scale enterprises,” have been required to adopt the same accounting procedures as public companies. But the rules on publication of financial balance sheets still divide opinion, because the law is silent on whether such publication should be mandatory. 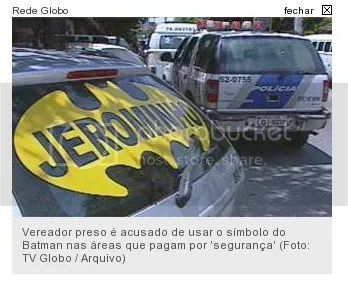 Caption: “City councilmember arrested is accused of using the Batman symbol in areas that pay for ’security’ (Photo: TV Globo archives).” Source: G1/Globo (Brazil). Justiça acusa deputado Natalino de integrar grupo de milícia: A member of the state assembly, the brother of a Rio de Janeiro city lawmaker accused of heading “militia” groups in the Western zone, are indicted by the “special forum” of the state court — reserved for criminal cases against elected and appointed government officials — for running a “militia” protection scheme known as the Justice League. O Dia notes the development briefly..
Rio – O Órgão Especial do Tribunal de Justiça do Rio aceitou, na tarde desta segunda-feira, por 14 votos a sete, denúncia de formação de quadrilha apresentada pelo Ministério Público Estadual contra o deputado estadual Natalino (DEM). Ele e outros 10 são acusados de integrar o grupo conhecido como Liga da Justiça. The Special Forum accepted on Monday afternoon, by a vote of 14-7, the [racketeering] charges against state deputy Natalino (ex-PFL). He and another 10 persons are accused of being members of the group known as the League of Justice.